could do for your yard. any of the services we offer. 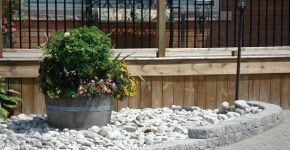 Welcome to Quality Fence and Landscaping, where we believe that good, quality fences really do make for good neighbours. As an owner-operated business, I am involved in every project that we undertake and on-site to answer any questions you have. My sons also work on job sites with me, ensuring that our standards of quality and fair pricing are a continuous feature of doing business with us. To learn more about our design services and free estimate, contact us today. Quality Fence and Landscaping was started in 1986 and over the years has gone from an owner-operated business to a family business. I do a majority of the labor and fencing in the business, and my two sons work in the business as well. We are proud to provide our services to residential home owners, property maintenance, home builders, warehouses as well as commercial and industrial companies. To get your free estimate, give us a call.